The first major grilling holiday of the summer—Memorial Day—is in the rearview mirror. Did you have all the tools you needed? Or were there some gaps in your tool kit? As anyone who has substituted the thin side of a dime for a proper screwdriver knows, the proper tools make all the difference. 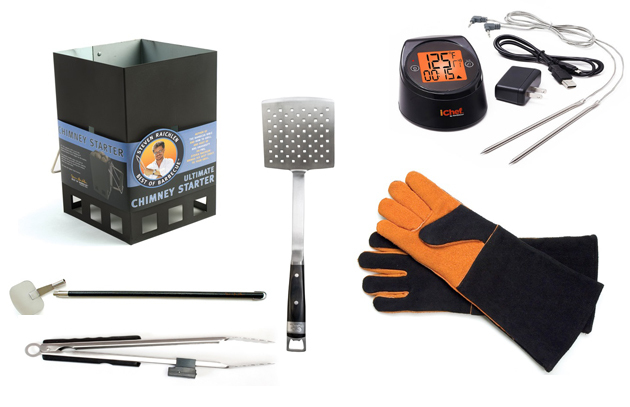 Here are ten I consider essential for grilling and smoking. Grill brush or scraper: It’s something you do every time you light your grill and get it ready for grilling. And every time when you’re finished. Scour the grate with a stiff wire brush or scraper. When selecting a grill brush, choose one whose bristles are firmly anchored into a twisted wire armature, so they can’t pull loose and wind up in your food. For example, the Ultimate Grill Brush. Alternatively, pick up one of the wooden grill scrapers now available in grill stores these days. Avoid cheap brushes whose bristles fall out when they get wet. Chimney starter: Owners of charcoal and wood-burning grills can be ready to cook in just 15 to 20 minutes—about the same amount of time it takes to fire up a gas grill. Position a petroleum-based fire starter or crumpled newspaper underneath the unit, light, and the chimney starter does the rest. For a righteous, wood-enhanced fire, I like to fill the chimney starter with hardwood chunks. Suede grill gloves: Grilling involves handling hot chimney starters, hot coals, and reaching across a hot grill grate. So you want a pair of sturdy insulated suede grill gloves. That are supple enough to preserve your dexterity. With sleeves that reach up to your elbows to protect your arms from the heat. Tongs: “Turn, don’t stab” is one of my grilling mantras. And for that, the best tool is a set of long handled, spring-loaded grill tongs. A BBQ fork pokes holes in the meat–best avoided when you can. I’m partial to tongs I invented called Lumatongs, which, have a two bright LED lights on one arm (removable) to illuminate the grill grate during an evening cook session. Insulated gloves: The trick to perfect pulled pork or beef is to cook it to an internal temperature of 200 degrees, then shred it while it’s still uncomfortably hot. Insulated for comfort and coated with rubber, these gloves will help you maintain your dexterity while protecting your hands from the heat. Wear them when you handle beer can chicken. Spatula: Handsome and well-made, this spatula has a sturdy oversize blade with a sharp leading edge to release food from the grill grate and perforations to discourage sogginess. The handle is sleek pakkawood. If it wasn’t useful enough, a handy bottle opener is built into the stainless steel handle. Rib rack: If you own a kettle grill or even a Big Green Egg, you’ll appreciate the space-saving features of this well-designed rib rack. Four large arcs support full racks of pork spare ribs, baby backs, or beef ribs, quadrupling your grill space. (You have plenty of time to order one for the Fourth of July celebration.) Ribs that cook in a vertical position baste themselves, yet form perfect bark. Nonstick and rust-proof. Wireless roasting thermometer: A reliable remote thermometer will pay for itself the first time you bring a perfectly cooked hunk of prime rib or thick dry-aged steaks to the table. With the price of meat these days, you can’t afford to make mistakes. My favorite thermometer, by Maverick, has two meat probes, a sleek digital base unit, and Wi-Fi connectivity so you can monitor the meat temperature from anywhere within range of your router. Priceless. Charcoal and ash hoe: No skilled pit master would want to be without this handy tool, which you can use to adjust the depth of your coals. (The deeper the coals, the hotter the fire.) You can even establish a fire-free zone where you can move food if flare-ups occur, as they often do with fattier meats like pork belly or even buttery garlic bread. Extra points if the hoe has an extra-long handle. Wire mesh grilling basket: From time to time, we’ve all made sacrifices to the grill gods, accidentally dropping a shrimp or a chicken wing through the grill grate. But a grilling basket will keep the donations to a minimum while still allowing flavorful heat and smoke access to the food. Terrific for mixed vegetables, clams or oysters, mushrooms, and of course, the aforementioned shrimp and chicken wings.